In this video, we will discuss HandleError attribute in asp.net mvc. HandleErrorAttribute is used to display friendly error pages to end user when there is an unhandled exception. Let us understand this with an example. Step 1: Create a blank asp.net mvc 4 application. Notice that, the Index() action method throws an exception. As this exception is not handled, when you run the application, you will get the default "yellow screen of death" which does not make sense to the end user. Now, let us understand replacing this yellow screen of death, with a friendly error page. 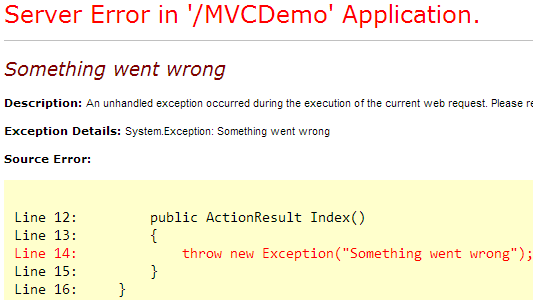 Step 3: Enable custom errors in web.config file, that is present in the root directory of your mvc application. "customErrors" element must be nested under "<system.web>". For detailed explanation on MODE attribute, please watch Part 71 of ASP.NET Tutorial. Step 4: Add "Shared" folder under "Views" folder. Add Error.cshtml view inside this folder. Paste the following HTML in Error.cdhtml view. Run the application, and notice that, you are redirected to the friendly "Error" view, instead of the generic "Yellow screen of death". We did not apply HandleError attribute anywhere. So how did all this work? HandleErrorAttribute is added to the GlobalFilters collection in global.asax. When a filter is added to the GlobalFilters collection, then it is applicable for all controllers and their action methods in the entire application. Right click on "RegisterGlobalFilters()" method in Global.asax, and select "Go To Definition" and you can find the code that adds "HandleErrorAttribute" to GlobalFilterCollection. Is the friendly error page displayed for HTTP status code 404? No, but there is a way to display the friendly error page. In the HomeController, we do not have List() action method. So, if a user navigates to /Home/List, we get an error - The resource cannot be found. HTTP 404. Step 1: Add "ErrorController" to controllers folder. Copy and paste the following code. Step 2: Right click on "Shared" folder and add "NotFound.cshtml" view. Copy and paste the following code. Step 3: Change "customErrors" element in web.config as shown below. for the Index Action Method. Followed all the steps in the Video.